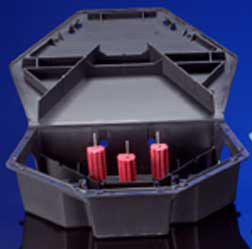 Bell LP Stations are triangular shaped rodent bait stations that fit in corners and along walls where rodents love to travel. Their "Low Profile" style make them perfect for use indoors, under pallets, and in other tight fit baiting locations. PROTECTA stations hold all kinds of bait, including popular BLOX baits which will fit perfectly on horizontal OR vertical bait securing rods. Patented interior baffles lead rodents directly to bait making this one of a kind trap perfect for use in all baiting situations. Protecta LP locks automatically when closed stays locked due to a special 2-prong latching system. The one-piece liner makes cleaning and rebaiting Protecta Bait Stations easy.